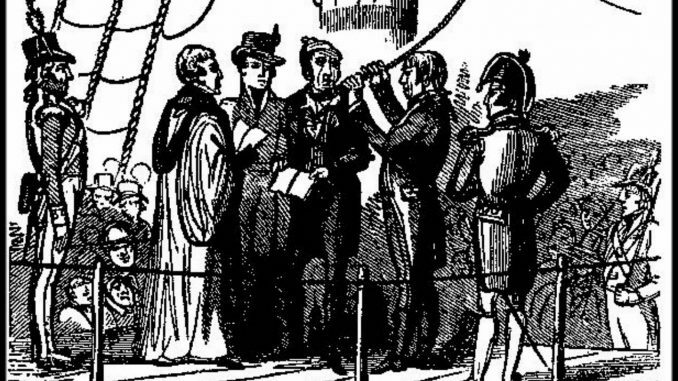 Preparing for an execution aboard ship. From The Naval Chronicle for 1807, Volume 18, p 342. On the 2d of October, a court martial was held on board the Salvador del Mundo, in Hamoaze, Plymouth, on charges exhibited by Captain Dilkes, of his Majesty’s ship Hazard, against William Berry, first lieutenant of the said ship, for a breach of the 2d and 29th articles; the former respecting uncleanness, and the latter the horrid and abominable crime which delicacy forbids us to name. 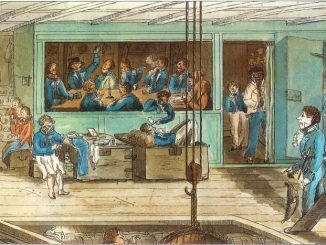 Thomas Gibbs, a boy belonging to the ship, proved the offence, as charged to have been committed on 23d of August, 1807. Several other witnesses were called in corroboration; among whom was Elizabeth Bowden, a female who has been on board the Hazard these eight months. Curiosity had prompted her to look through the key-hole of the cabin-door, and it was thus she became possessed of the evidence which she gave. She appeared in court dressed in a long jacket and blue trowsers [sic]. The evidence being heard in support of the charges, but the prisoner not being prepared to enter upon his defence, he begged time, which the court readily granted, until ten o’clock the next day, at which hour the court assembled again, and having heard what the prisoner had to offer in his defence, and having maturely and deliberately weighed and considered the same, the court were of opinion, that the charges had been fully proved; and did adjudge the said William Berry to be hanged at the yard-arm of such one of his Majesty’s ships, and at such time, as the Right Honourable the Commissioners of the Admiralty shall direct. Sir J.T.Duckworth was the president. 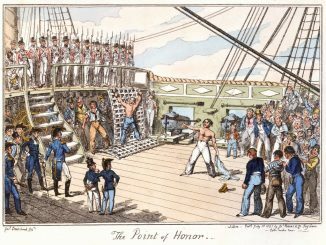 The unfortunate prisoner was a native of Lancaster, and only in his 22d year, above six feet high, remarkably well made, and as fine and handsome a man as in the British navy. He was to have been married on his return to port. 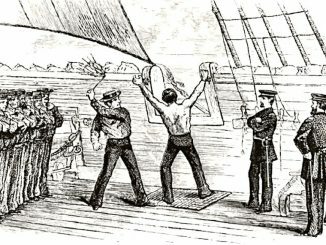 The awful sentence of the court was carried into execution on Monday the 19th of October, on board the Hazard, in Plymouth Sound, the prisoner having been removed from the Salvador del Mundo into that ship which lay alongside a hulk in Hamoaze. At nine o’clock he appeared, and mounted the scaffold with the greatest fortitude. He then requested to speak with the Rev. Mr Birdwood on the scaffold; he said a few words to him, but in so low a tone of voice they could not be distinctly heard. The blue cap being put over his face, the fatal bow gun was fired, and he was run up to the starboard fore-yard-arm, with a thirty-two pound shot tied to his feet. Unfortunately the knot had got round under his chin, which caused great convulsions for a quarter of an hour. After being suspended the usual time, he was lowered into his coffin, which was ready to receive him in a boat immediately under, and conveyed to the Royal Hospital, where his friends meant to apply for his body for interment. He was dressed in a blue coat, white waistcoat, blue pantaloons, and boots. For the last week he seemed penitent, firmly collected, and prepared to meet his fate. Courtesy of Age of Sail Resources.